Kangaroos Hop helps children identify favourite Australian animals in the Australian landscape. The kangaroos hop, the butterflies fly, the echidnas shuffle across the land and down to the water's edge where a sleepy crocodile lies.Shhhh! The lively illustrations and cumulative text help readers identify animals as well as verbs. This book is a delightfully simple story written by Australian author, Ros Moriarty. It is a fun, progressive story featuring iconic Australian animals as they make their journey to the water's edge. "The kangaroos hop" start off on the opening page, and are joined by another animal at the turning of each page, culminating in an interesting list of Australian animals. Each animal is introduced with a verb that captures the nuances of the individual animals: "the echnidas shuffle”, “the butterflies dance". Although the book would be aimed at three to six year olds, the rich language of the verbs and metaphors, lends itself to language discussion and extension. The cumulative repetition on each page is great for a young audience who would love to join in, as they remember what has happened on previous pages. The illustrations are brightly coloured and feature the dot pattern seen in Aboriginal art. The artist has beautifully captured the essence of the animals’ movements. Set against the white background the vibrancy of the brightly coloured animals is perfect for capturing the attention of the younger listener. As day passes animals head to the riverbank. It’s an easy journey as lizards run, echidnas shuffle and butterflies dance their way there. But what’s that lurking on the bank? 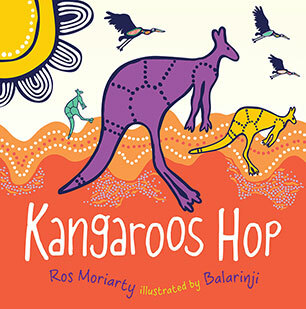 Kangaroos Hop by author Ros Moriarty (Allen and Unwin, 2012) is a bright and engaging early childhood picture book. The bold colours of the indigenous illustrations from the Balarinji Studio depicts the animals, bringing another level of interest. The rhythm and repetition entices the reader and audience to turn pages with each new double spread introducing a different and familiar Australian wildlife creature to the journey. As young readers form better speech and understanding there is fun in reading Kangaroos Hop. They will be calling out the types of animals as they learn to identify them, plus counting the number of animals and indentifying colours. But for this reader it was the verbs, bringing an equal share of colour to the story, enjoying how differently animals move, to the usual "walk" or "run". Ros Moriarty is the founder of Indi Kindi pre-literacy education and her quality of writing is inspiring. Kangaroos Hop is a fun read, lively and vivid, leaving an echo playing inside my head. At the end of the book is a Yanyuwa translation to encourage language skills. 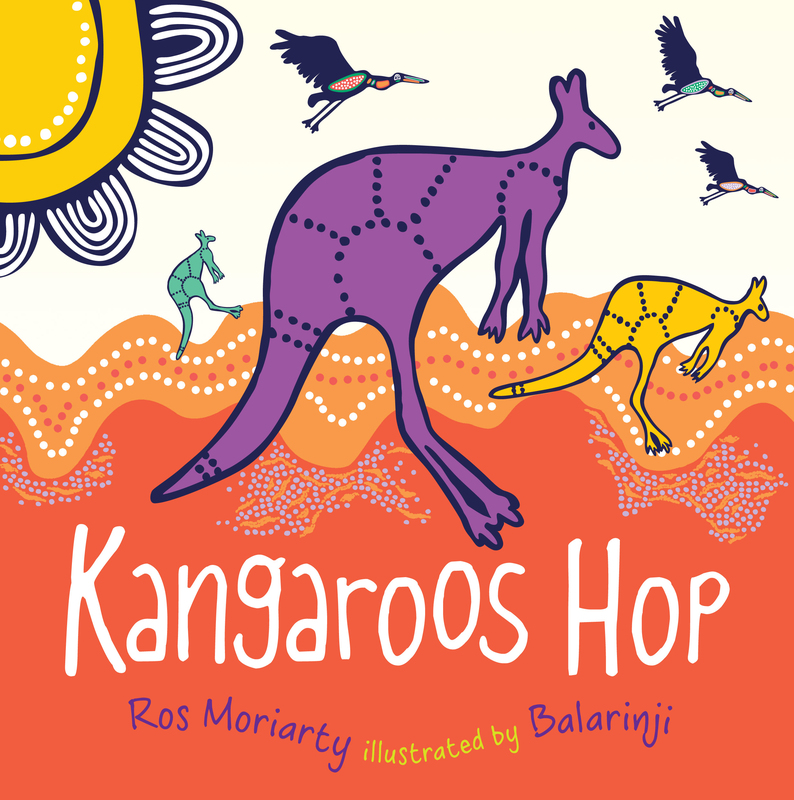 Kangaroos Hop written by Ros Moriarty and illustrated by Balarinji Design Studio is a vibrant, beautiful book that is sure to become a favourite with young children. The vivid, contemporary coloured Aboriginal art illustrations on the cover invite the reader to look inside to discover more. The bright purple, yellow and green kangaroos hopping across an ochre coloured land, together with brightly coloured birds flying overhead are all moving in the direction of the story that lies behind the cover. In the book, the reader is taken on a journey with colourful native birds and animals all heading for the river…and an unexpected surprise. The story builds up gradually, flowing from page to page in a bold, clear text that is easy to follow word by word for an emergent reader. The creatures mentioned in the story offer a great opportunity for language development. On the back page of the book the story is told in the Yanyuwa language and a map shows the area in northern Australia where this language is spoken. The blurb on the back of the book says: Kangaroos Hop celebrates animals, verbs and the brilliant art of Balarinji design studio. It certainly does this with great enthusiasm and energy and is sure to be a favourite with younger children.